In my last post I briefly introduced Kim English. I feel the need to go a little deeper and share my thoughts on his paintings. I regularly visit pinterest and flip through images and paintings and every time his paintings stand out. Why is that? Because they’re so good you might say. True, but why? Understanding this may help me loosen up in my own work. It’s beneficial to attempt to understand how a fellow artist operates so you can apply it in your own workflow when you feel the need to. Without straight up copying it. The following article is largely based on assumption and bits and pieces of information I found scattered on the net. 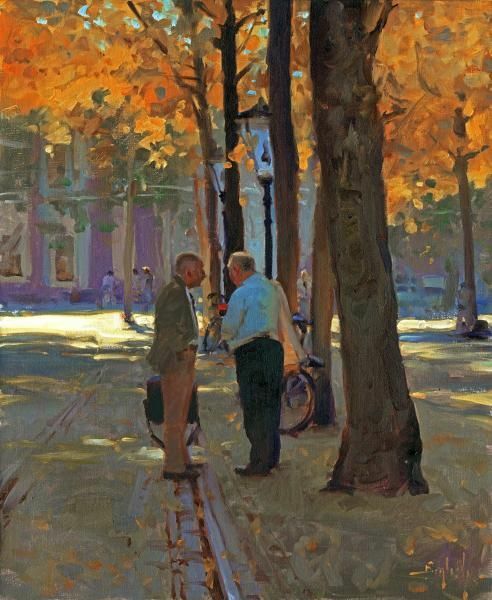 This example (a conversation -by Kim English) , which is another one of my favourites, shows a couple of elderly gents having a conversation beneath some trees on a sunny afternoon (in the Hague – Netherlands). One would assume it’s autumn due to the orange leaves but I don’t think so. The orange colour is the result of a quarter twist of the colour wheel. If you take a look at the color wheel image below and you make a color scheme based on what you would see in real life you would most likely come up with something like Blue, Green, Yellow, Red. A print shop employee can tell you that you can print any image with just those colours. Same goes for a painter. Now imagine the color wheel as a clock. and you limit the paints on your palate to lilac, reddish orange (cadmium orange or vermillion), yellow-ish green and a brown.